At Manchester International School , we believe that student development extends beyond the normal academic school day and that important learning and development should take place in other settings. 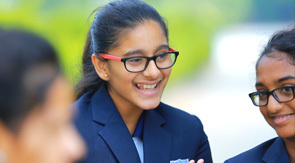 Manchester International School offers a wide variety of club activities that match the diverse personalities and interests of our student body. The core programme of clubs and activities incorporates elements such as athletics and fitness, music, drama, human movement, visual art, craft/design and teamwork and leadership. A balance of competitive and recreational activities is offered in these areas, as well as activities of individual and group natures. All teachers assist with clubs and activities. The Interact Club at Manchester International School was created in July 2016. The club members are enthusiastic students who are strongly committed to supporting community service projects. Stepping ahead to help our society has been the motive of Manchester since the school was initiated five years ago. All the students at Manchester International School have been contributing selflessly to improve the schooling in nearby areas. Manchester International School Interact Club is constantly contributing its supports towards the adopted schools by rotary club of legends, Coimbatore. The Interact club at Manchester though still an infant has many projects conducted like eye camps, fire awareness programme, special cultural and sports programme with rotary exchange students, supplying the seedlings, planting tress etc... And many are in the pipeline like blood donation camps, awareness drives for social issues in the surrounding villages etc. Manchester International School interact Interact Club has started working with the spirit, vigour and hopes to bring about a positive lasting change in society. The benefits of club activities for children are wide as well as varied, ranging from physical benefits because of the promo of raised activity, to emotional as well as social advantages. Scientific research shows that encouraging kids to take part in activities club might aid their advancement. Professionals in kid advancement recommend that engagement in after-school activities often is the most effective way to help youngsters establish their private character, reduced psychological tension, and also boost social or scholastic skills that could benefit them in the future. Psychologists also recommend after school tasks as the favored selection over confidence-building classes. Every leading study relating to the impact of after-school activities on child growth reveals that academic qualities, research study behaviors, and school-based actions all boost when kids participate in routine clubs and also group sports. Nevertheless, if a kid discovers something brand-new in an afterschool activity, it could increase their understanding of school subjects also if that activity does not connect directly to classwork. Discovering that they have a ability for something can provide kids a brand-new source of self-confidence or enthusiasm that translates into their behavior at school. Inning accordance with research, young people who frequently join School club tasks are more likely to reveal greater levels of attention in course, be extra taken part in school, and are much less most likely to establish an inclination for fierce or problem actions. What's even more, some extracurricular activities supply pupils with the centers as well as time to pursue rate of interests that they might not be able to go after at school. No matter whether they're establishing brand-new relationships, or building after existing relationships, after club activities give an excellent environment in which to nurture social skills and self-confidence. Countless extracurricular activities work to educate children the worth of working as a team to achieve a mutual objective-- a skill that will benefit them in their future occupation. Likewise, engaging with new individuals in a productive environment assists to strengthen independence as well as confidence in children. The even more they discover their capabilities within a brand-new atmosphere; the a lot more children can develop a feeling of their own character, and even establish critical leadership abilities. By working with others outside of a classroom setup, young people start to find out the worth of improvisation, sharing concepts, and also using assistance to peers in challenging circumstances. Club activities use a positive atmosphere in which youngsters could expand as well as flourish when moms and dads are working and also unable making it house for right after school. Lots of adults today stay at work after the school day has ended. Club activities remove the lure to being in front of a television. What's even more, a number of School club activities advertise emotional well-being by allowing youngsters to work off excess power, relax their minds, and overcome the stress and anxiety connected with school life. While sporting activities aid to remove several of the tension that might have constructed during the day, scholastic clubs aid to decrease the tension connected with getting ready for tests by using added help and support. Ultimately, children with a regular hobby are likely to invest much less static time glued to a mobile phone or display. Not only does the time invested within a club urge your child to remain active and also away from the couch, but the passions that they develop throughout those clubs will certainly trigger them to invest even more time practicing skills as well as pursuing their enthusiasms. As a matter of fact, the Afterschool Alliance has actually carried out research right into the impact of after-school activities on child health and wellness, as well as located that they are vital in advertising a healthier way of life. Studies of School club programs have actually revealed that weight problems levels are typically much lower in program participants, with only 21% of youngsters experiencing weight issues compared with 33% for non-participants. The skills and routines a child learns during his or her academic year aid to shape the kind of future they will certainly lead as a grownup. Because of this, after school activities that promote whatever from healthy-living behaviors, to management abilities, excellent time-management, and better social or academic efficiency have a lot of benefits to provide. Keep in mind that you shouldn't press children to over-do it when it comes to after school activities. It's much better for youths to choose something that they truly take pleasure in doing as well as stick to it, than effort countless various activities that rapidly end up being frustrating, as well as might detract from their capability to focus on school work. "There are many activities you can explore in the school, ranging from robotics to theme based Smart board applications., I would like to share about tennis academy, skating academy and dance academy which we are really enjoying after school. I am so proud that I am in one of the best International boarding school in India."